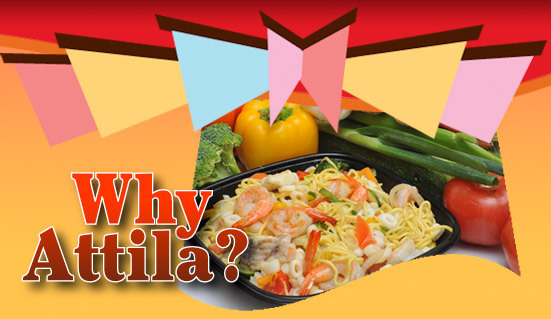 What is Attila Mongolian Grill Concept? Attila Mongolian Grill has been founded on the idea that people want an exciting alternative to fast food restaurants—a place with great tasting food that’s healthy, fresh, and still served fast. The Attila Mongolian Grill concept defines the freedom and individuality that customers desire in a Unique dining experience. The Customer is the Master Chef and every single meal is their unique creation. The buffet style ingredient selection gives customers the creative control. All the elements to create the perfect meal are at the customers’ fingertips, which is where the fun begins. Customers start their culinary experience at the buffet area filling the 4 individual bowls with their favorite ingredients of wide variety of meats, seafood, fresh vegetables and signature sauces. Then they carry their tray to the focal point of the restaurant were the Master Griller greets them and stir-fries their chosen meal before their eyes. Upon presenting the cooked meal to the customer, the Master Griller hits a gong to announce that another satisfied customer is on his way to enjoy his own signature prepared meal. At Attila Mongolian Grill, no two meals are identical. 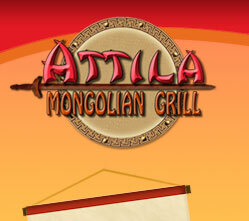 Attila Mongolian Grill offers a completely different spin on dining. In many ways, Attila Mongolian Grill is its own dining genre. It’s so unique and customers-interactive that it offers a curious diversification from the restaurant monotony that plagues most consumers.